If you've been eyeing up the recent Nikon D40x or the Nikon D40, now may be a good time to go for it. Nikon announced this morning that it is introducing a summer cashback promotion for the D40 and D40x kits (with the AF-S DX 18-55mm II lens). And also for the D40 and D40x twin kits (with the AF-S DX 18-55mm II and AF-S DX 55-200mm lenses). The 10-megapixel Nikon D40x is one of the smallest digital SLR cameras around. It offers a shooting rate of up to three frames per second, plus a large LCD screen. It sports a range of features like built-in auto focus, 3D Colour Matrix Metering and auto white balance. 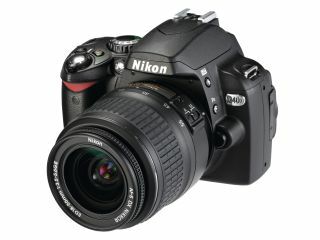 The Nikon D40 is a compact 6.1-megapixel digital SLR. It can shoot 2.5 pictures per second for up to 100 shots and includes a bright 2.5-inch colour LCD display. The cashback ties in with Nikon's 90th anniversary this year. You'll be able to claim back £60 on the above combination of products. The offer is valid for purchases made between today, 1 June, and 31 August 2007. You must register before 15 September in order to get your money back. To claim your cash, go to the Nikon website for instructions on how to make a claim as well as detailed terms and conditions.